HPC Airframe Industries is in a bit of financial trouble. The company has always built peculiar planes with too little of a market to really flourish. The company's involvement with Star Force has also been bittersweet: Previous customers among the Federation's rivals have all but boycotted HPC. Every so often, Star Force places an order for something just enough out of corporate giant United Star Fighters Incorporated's typical line of work, letting HPC Airframe Industries swoop in and give Star Force their best. HPC's latest model is the Star Intimidator Class Star Bomber, intending to provide support for USFI's Star Cruiser III as the older bomber heads either to a refit or retirement. Well, specifically it's the dilithium processing cores. The Star Intimidator has four of these cores. Protecting the Star Intimidator are standard deflector shielding and ablative armor. United Star Fighters Incorporated (Star Falcon V Mk2, Super Star Scout, and Star Cruiser III) versus HPC Airframe Industries (Galidor Dropship, Galidor Fighter, and Star Intimidator). I need an LXF... I think that this might be one of those rare extremely awesome designs that only really shine when looked at in LDD, but only look "good" in pics. I'll say more when I can get a closer look at this thing. But I suspect is will be very positive! I disagree dino, I think it already looks good. By that I mean great, not "meh, good." I love the dropped front cockpit. The top of this thread, under the first picture, is an "LDD File" link to the LEGO Gallery. The fourth picture is the LDD file. Um... I discovered some flying bricks in the LDD file posted above. I've already fixed them on my file so I'll reupload the LDD file on the LEGO Gallery. Wow. This is gorgeous, Talmid. ... Tell me I didn't just miss the obvious hyperlink.... oops. Yep, LXP confirms it, this thing is AMAZING! Possibly your best "unique" small craft ever. And this is certainly in the running for best Talmid small craft yet, unique shape or not. I love it! WELL done! My hat is off to you. Anyways, this thing is great! I love the rugged, sleek design. Thanks Dino, Arik, and AA. I'm glad and actually quite surprised by all the praise it's getting, tho I do understand you guys really appreciate original work, and this craft is very unique looking compared to every other of my planes which all look the same, heh. Personally the Star Intimidator doesn't look so right to me, I tried five wing designs before building the current set, coupled with the engines, by accident, and I didn't have anything better. I'm also not too much of a fan of the final side-facing sloped SNOT alongside the lower cockpit but the entire ship ended up acceptable to me, also considering I spent a lot of time getting the design to stick together and I wanted to post it already. Based on all the quirkiness, it was easy to pass it off as a quirky HPC design, since it didn't end up having the gracefulness I want to associate with USFI. 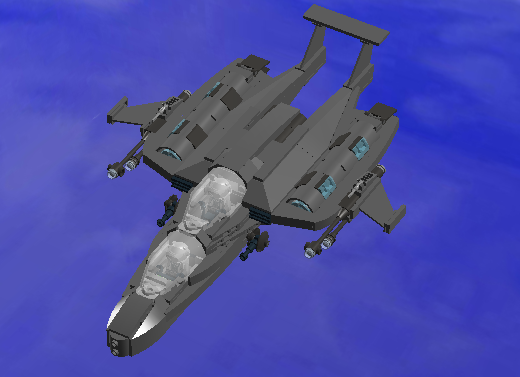 Also, I'm not sure if they got noticed but I added two more fighters to the Space Pirates subforum: another design out of Ultra Fighters and a true plane of my own. Check them out if you please. The wings bugged me at first in the pictures too, but once I saw the LXF, I instantly said "It looks like an attack helicopter/gunship, that's awesome!" So once I made that mental shift from "fighter jet" to "attack helicopter" it instantly clicked as what it is, a beautiful design. Sloping SNOT along the lower cockpit, really, you don't love it? I think it looks GREAT! But then an artist IS his own worst critic. Oddly enough, I see it as graceful, in a unique, utilitarian raining death from above, kind of way. Seriously, it looks like something out of Halo/Avatar for a human craft, and it is AWESOME! VERY different from your usual, and yet equally as good! On an even closer look, I see what you mean about the wings, and I think I have a REALLY simple solution to bring the design together. The majority of the wing already looks great, but I think that reversing the tips gives it a more aggressive look, and pulls it all together. Dino, I think that does the trick. :O The forward-sweep also directs air towards the inners of the wings where the maneuvering flaps are, so I think that should increase handling. You just needed another pair of eyes because yours were tired of looking at it. With a break from working on it, I think you would have been likely to see it.